Stellaria media. 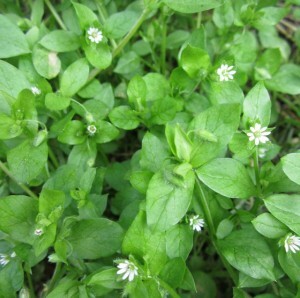 Chickweed is a low-growing plant that flourishes in moist soils. It is a common weed – an opportunist that will flourish in any wet place it can take root including carefully managed gardens and randomly available city dirt patches. 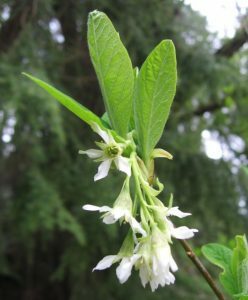 It can be identified by its white star-like flowers and by the single line of hair that runs down the length of the stem. The above-ground plant has a pleasant, mild flavor. Eat the tender new growth or just the top couple of inches on older plants in salads, sauces, soups and other dishes. If it has a stringy texture, it is too old. Chickweed is a powerhouse of nutrients. Spinach is the most mineral rich green on the market but chickweed boasts 12 times more Calcium, 5 times more Magnesium, 83 times more Iron and 6 times more Vitamin C! It is also valued medicinally for its soothing and diuretic qualities. Taraxacum vulgare. This “noxious weed” is one of our most useful wild foods and medicines. The whole plant is full of nutrients including vitamins A, C, E and B complexes. It also contains high amounts of Iron, calcium, potassium and trace minerals. 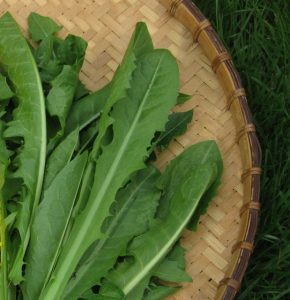 Dandelion greens are eaten fresh or sautéed in the early spring while they are still tender. They become bitter as they get older and are exposed to the sun. The mildest tasting leaves are young and grow in shady areas. Try adding leaves to salads or sautéing them with a little garlic, olive oil and balsalmic vinegar. Make sure you harvest true dandelion leaf, which does not have hair on its leaves. Oemleria cerastiformis. Also called oso berry, Indian plum is our first bush to leaf out after the dark winter. Its’ bright green leaves light up the forest and remind us that new life is on its way. Small white groups of flowers arrive soon after the leaves, resembling cascading waterfalls as they bloom. The young leaves taste similar to cucumber rind. They can be eaten in salads or on sandwiches. Older leaves become intensely bitter. In late spring tiny fruits ripen into purple looking plums. They have a refreshing taste that is reminiscent of Italian plum and cucumber. 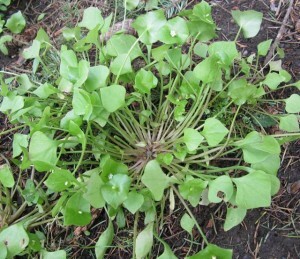 Claytonia perfoliata. 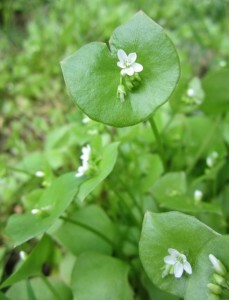 Candy flower or Siberian Miner’s Lettuce Claytonia sibirica. These lovely little plants often form delicate green carpets in shady wet areas. 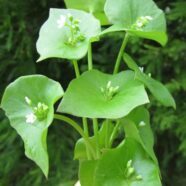 Miner’s lettuce has a unique shape. The stem runs right through the center of a roundish leaf and culiminates in tiny white flowers. Candy flower has smooth-edged leaves on succulent stems that are often rosy colored at the base. 5-petaled flowers have distinctive pink stripes on them. The whole above ground plants can be eaten, including stems and flowers. They are very mild and similar in flavor to domesticated lettuce. Viola spp. There are many kinds of violets in the northwest including early spring violet, marsh violet, Canada violet, stream violet and trailing yellow violet. Flower colors range from white to purple to yellow. 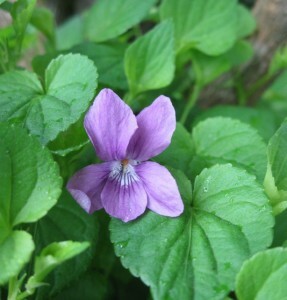 Violets are low growing plants with small heart shaped leaves. Some are wonderfully fragrant. You will need to get down on your hands and knees, but the smell is worth it! All violet leaves and flowers are edible, including their close relative, pansies and Johnny jump ups. 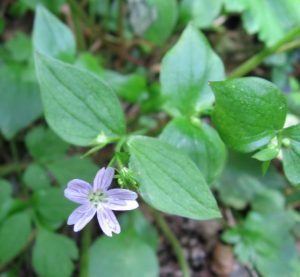 According to herbalist Janice Schofield, just two violet leaves fulfills the daily requirement for vitamin C. Violet is a nutritious spring trail snack and can be added to salads, soups, sautés, sauces and whatever else your imagination can come up with. Oxalis stricta. The tender leaves of wood sorrel will surprise and delight most palates. Even my 2-year old enjoys their tart lemony flavor. I have to watch her like a hawk to make sure she does not graze the whole patch in our garden. 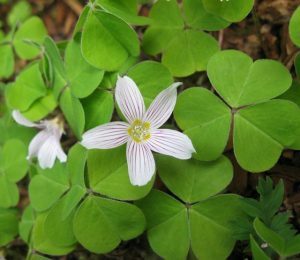 You can identify wood sorrel by its three heart-shaped leaflets that resemble shamrocks. Our wild varieties have bright green leaves with yellow 5-petaled flowers, but many nurseries now sell variegated leaf varieties with different colors of flowers. All are edible. The tartness comes from oxalic acid and other acids. Unless you are eating a huge amount, this is not a problem. Wood sorrel leaf is a nutritious green that can be added to salads and other dishes. It contains more Iron than spinach. The flowers are tiny but edible, and make a beautiful garnish. 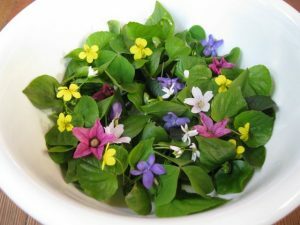 This delicious salad features early spring greens that are likely to be out from March through early May. You can modify it based on when you are harvesting and what wild greens you have access to. Place hazelnuts on a cookie sheet and roast in the oven at 300 degrees until they smell fragrant and begin to brown, about 15 minutes. Set aside to cool. Wash and drain lettuce, wood sorrel, violets and other greens. Cut hazelnuts in half. Tear larger leaves into bite sized pieces and place in a salad bowl. Place all other salad ingredients on top and dress with dressing of your choice. Wonderful info! Right when I was headed intimate the woods to look for food!